Location: Exact location to be announced but will be in the downtown Revelstoke area. If you have excess fruit and don’t know what to do with it this year, join our Fruit Share group and share your fruit: https://www.facebook.com/groups/392517164556454/ or check out our new Revelstoke Fruit Share website. 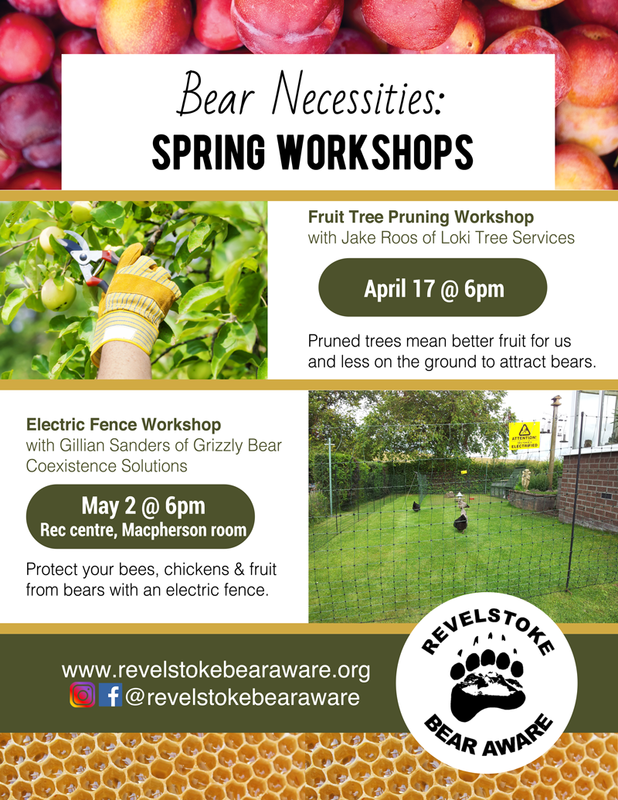 Join Revelstoke Bear Aware and Gillian Sanders of the Grizzly Bear Coexistence Solutions for an Electric Fence Workshop. Get ready for the summer season and protect your beehives, fruit and nut trees and chickens from bears, in turn you’ll also be protecting bears against habituation. As it turns out setting up and taking down an electric fence can be super simple! Learn how. Workshop leader Gillian Sanders has helped to install 150 electric fences to successfully protect livestock and/or fruit trees from both black and grizzly bears. Correctly installed and maintained electric fencing provides a cost effective and easy solution to prevent or stop bear conflicts. This workshop will discuss different electric fencing designs for permanent and temporary fences that can be adapted to your particular needs. The workshop will begin indoors for an overview of the different types of electric fences and the best solutions for us in Revelstoke. Then we will venture outdoors for a demonstration on how easy it is to set up an electric fence yourself! Workshops are by donation or free for Revelstoke Bear Aware members.